Hi! My name is Sarah Hina! I’m honored you’re considering my services to help you navigate your Disney vacation journey, whether it’s a first-time trip to Walt Disney World or an extended-family sailing on Disney Cruise Line. My aim is to make each step of the vacation planning process as seamless and stress-free as possible, so all you have to do is sit back and enjoy an unforgettable experience with your loved ones, making memories you’ll treasure for a lifetime. While I currently live in Ohio, I grew up taking trips to Disneyland, following in the footsteps of Walt Disney himself. (Strange, but true: I was born in the same hospital he died in!) Of the three siblings in my family, I was the only one my parents had to drag out of the park each night, because I just couldn’t bear for that Disney spell to be broken. So it was no surprise that when I grew up and got married, my husband Paul and I vacationed with our two children to mostly Mouse-friendly destinations . . . not once . . . not twice . . . but eight times over the last ten years! 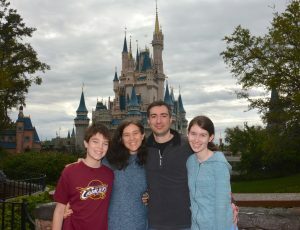 Feeling extraordinarily grateful for these opportunities, I decided to share the knowledge I’d gleaned about the Walt Disney World parks, resorts and restaurants with guests mulling their own trip to Orlando, in the form of a book: The Step-by-Step Planning Guide to Your Walt Disney World Vacation. So if you want a vacation planner by your side who’s literally written the book on doing Disney right—I’m happy to say your search is over! While writing a planning guide was immensely gratifying, I still found I had that Disney itch to scratch when the time came to publish. That’s when I turned my sights toward becoming an Authorized Disney Vacation Planner. I found my passion and love for Disney destinations reflected back at me from the wonderful agents here at MickeyTravels—along with the kind of attention to detail and total commitment to their clients I knew I would want for my own family. At MickeyTravels, we really are all about extending that gold-standard Disney customer-service philosophy into Making Magic One Vacation at a Time™️! And the best part is: our services are completely free of charge to you! Now that you know a little more about me, I’d love to learn more about you! What kind of Disney destination is your heart set on? Contact me at 740-707-6167 or shina@mickeytravels.com so we can turn those ideas into a reality that perfectly captures your vacation budget, travel style and ultimate Disney fantasies! Let’s get doing and plan your Disney vacation!